What is a sweet, soft-spoken girl (Ha Li Kang) to do when her brothers, having just learned fencing and martial arts, decide to test some moves out on her in order to "tame her" and make her into their "little slave?" She runs to her knightly friend (Te Hu Kang, not related to Ha Li) for protection, of course. However, what happens when, instead of comforting her, he tells her that she is a coward for running away like a puppy who needs constant protection? No, she does not break down and cry like a weak girl. Instead, she resolves to grow stronger. With rigorous training everyday, Ha Li goes from being a scared girl who cries for help to becoming the Jjang (boss of a gang) of the Doberman gang. However, events lead to Ha Li getting in an accident with a truck. Afterwards, she is reborn into the body of a beautiful, but weak, rich girl Aram Han. At her new school, everyone is surprised at the sudden change they see in Aram, who has gone from a gloomy, good student to a rude, carefree troublemaker. Many people bully her. When Ha Li finds out that it is all due to Sin Uoo Park, the handsome prince and Jjang of the school who detests Aram, she decides to have a duel with him for the position of Jjang. 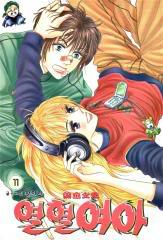 What will happen next is for you to find out in this romantic comedy Korean manhwa. Dude! omg!! I really love this manhwa! I like read it in one day!